the sun, wonderfully seen through Whitman’s eyes. 2018 saw a lot of delicious gluten consumption at different corners of the world: Madrid, Bologna, Bangalore, Montréal, San Francisco, Rome, London, Lisbon, and of course, home in Brooklyn. Panic’s stone-ground, whole wheat rye (centeno integral) is intensely flavorful with a deep dark crust. Euro 5.20/kg. Tumminia is a an wheat varietal from Sicily. The one that Forno Brisa uses comes from Castelvetrano in the province of Trapani. The grain has a slightly sweet profile, and as is common in much of Italy, the crust is barely dark. Euro 7/kg. Primarily a Neopolitan pizza and restaurant, Saraghina is also a bakery that makes naturally leavened breads using organic flour. Their whole wheat micca has a beautiful crust, and isn’t as dense, with a light and airy crumb structure. I find Josey Baker’s breads to have the most wonderfully burnished crusts. This particular specimen, made using stone-ground whole-wheat and whole-rye flours is slightly dense, with an incredibly moist crumb. $6.99 for a loaf. The bread at Aster is made using 35% whole wheat with 82% hydration, fermented for 20 hours. You can order the bread at the restaurant, where it is served with excellent house-churned butter which, to me, was reminiscent of Strauss Creamery’s 85% butterfat butter, but milder in taste, which I prefer. It wouldn’t surprise anyone that chef Brett Cooper was the chef at Outerlands, another bastion of excellent bread, before opening his own restaurant. The breads at Aster are primarily for use at the restaurant, but a limited supply, when available, can be bought for $7. Despite the poor customer service I experienced at Tartine, their breads remain incredible. This boule was $10.75. A dense bread using stone ground barley and New Zealand rye, this was an experiment for Nityananda and I think it turned out damn well. The loaf exuded a heady rye scent. When I say dense, I mean it, this was a bread better sliced into using a regular knife than a serrated bread knife. Inside the bread was incredibly moist. We typically ate this plain with butter; another time Maria Elena made a delicious bruschetta using olive tapenade, tomatoes, mozzarella and olive oil. The bread is sold by weight. This dense load, at around a kilogram, was ₹ 600 (around $9). Krumb Kraft does not have a storefront, but bakes on order. A more traditional sourdough made using a mix of whole wheat and white flour. ₹500 (around $7.5) for a boule. Made using flour from a mix of buckwheat, oat, whole wheat and white flour. I ate this with avocados, plain with butter, with Le Cendrillon, a delicious ash-ripened cheese from Québec, with peanut and sesame butter procured from La Finca in downtown Montréal, and with olive oil from Cilento. $5.25 CAD (around $4) for a miche. My dad, by way of my brother Vinod, dispatched this loaf for me from Bombay when he returned from London. Brick House’s miche is moderately dense (you can cut into it without a serrated knife), emanating a faint earthy scent. I typicallt ate this plain with butter, and on one ocassion with mozzarella from Vallombrosa Cheese Shop in Bangalore. Little Bread Pedlar’s brown sourdough is made using British wholemeal flour and a mix of cooked whole wheat and rye grains, cracked wheat and various other grades of milled wheat and rye. The crust is beautifully burnished, and it’s wonderfully chewy. Little Bread Pedlar has a stall every Saturday at Spa Terminus Market, but I bought mine at Giddy Grocer in Bermondsey, not far from The Shard. Dusty Knuckle’s sourdough, made using a mix of whole grain wheat and rye, has a deep crust, and is moist and quite airy inside. We made a lot of avocado toasts for breakfast using their bread. £3.80 (around $5) for 800g. Josey Baker’s Country Loaf is my benchmark sourdough bread – I haven’t had one that’s better. You can find Joey Baker’s breads at several locations in San Francisco, but I normally get mine at The Mill. The Midwife and The Baker’s 100% Whole Glenn Wheat bread is made using fresh milled hard red whole grain wheat. Not quite as moist inside, this dense loaf was beautifully burnished and had a deeply caramelized flavor melding in with the earthy wheat. Midwife and The Baker doesn’t have its own location, but their breads can be found at several Bay Area restaurants, stores and farmers’ markets. Little Bread Pedlar’s breads can be founds at several locations in London. I bought this loaf of their classic sourdough, the Field Loaf, at The Watch House in Bermondsey, not far from Bermondsey Square. £4.5 (around $5.75) for a loaf. My friend Tori made this heart loaf made using 100% organic Einkorn. This darker loaf, also Tori’s, was made using 80% Organic Type 70 Malted hard red winter wheat from Central Milling and 20% Organic 100% Whole Grain Red Fife wheat from Grain. Copenhagen Coffee Lab is an early specialty coffee purveyor in Lisbon. In addition to coffee, they also make really good sourdough. This whole wheat, rye and white flour loaf was 2.90 euro for around 460g. I often ate this with canned sardines. Copenhagen Coffee Lab has several locations in Lisbon now. A Padaria Portuguesa is a mini-chain with several locations in Lisbon and one in Cascais. Pretty much any Lisbon neighborhood you find yourself in will likely have one. 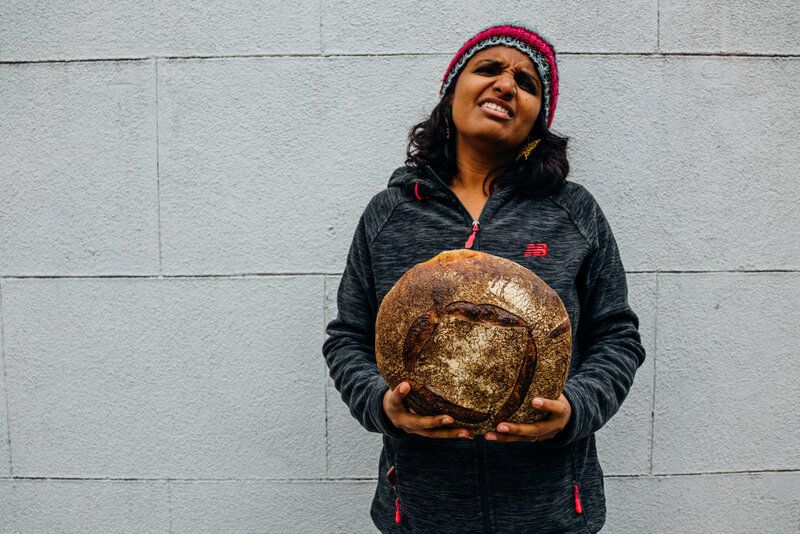 While their ubiquity might lessen the appeal of wanting to step into one, their LAB has a wider selection of breads than their “regular” locations. I stumbled upon LAB on my walk toward the National Library, pretty far out from the center, roughly in the Saldanha neighborhood, and was happy to procure a loaf of Pão de Castanhas, or chestnut bread. This medium-sized boule was €3 (around $3.4). Gleba, which not only bakes bread but also mills its own grains, is seeming to me to be the standard-bearer of excellent bread in Lisbon. I got a loaf of their extremely dense 95% Rye loaf on a pleasant walk from my Príncipe Real apartment to their space in Alcantara. This loaf was €5.68 (around $6.5) for 1.48 kg. You can find their breads at several locations all over Lisbon.